If Sunday’s weren’t made for cake eating/making then I just don’t know what it was made for? Like, seriously if you’re not relaxing on a Sunday and scoffing your face then you’re a pretty lame person. Or maybeeee just not a chubba like me? Anyway, Sunday the 2nd of August I was given the amazing opportunity to attend the ‘Intro to baking’ class with the lovely Curry’s. Having not attended anything like this before, I was a little unsure what to expect/ quietly hoping we’d be takin’ a cake on home and boy oh boy was I happy come 4:30pm. With any event there is always a specific reason behind it, whether it be a general meet up designed to get bloggers mingling, or to try out and promote a specific brand. Having loved baking in my youth(yes, I’m aware I’m only 26) and used Kenwood goods in the past, I was delighted to know we’d be both working with and promoting this amazing brand. Anyway, this amazin’ event was set up at Wilmslow cookery school, not too far away from my house and homing some amazing chefs who have worked at ridiculously good places to dine. So, if I wasn’t to get a great cake bakin’ game after this then God knows when I would! Arriving to the event with my lovely blogger buddy, Alex (because apparently we’re always together now) we said hi and took up our station. 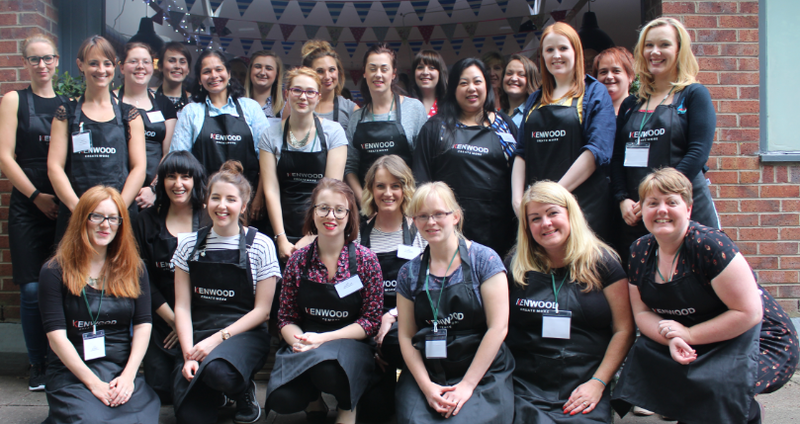 With Kenwood mixers galore and a whole lot of baking items, we were set to not only learn from the best but make some tasty desserts. Havin’ Alex with me and her being gluten free meant it was easier for myself to swop and do the bakin’ with another lovely blogger. This is when I met the lovely Jordan from ‘general life blog’ who would show me just how good cake makin’ could be, as to be honest I’ve realised I’m not so great haha. The lovely chefs from the cooking school informed us we we’re about to make three different things; 1. A chocolate tart, 2. Swiss roll, 3. Summer meringues. Er, hello drool. Firstly, we made the amazin'(and sugar induced) meringues. Possibly one of the trickiest of desserts to make, but by God did we all do good. In honesty my piping game wasn’t the best as some of the meringues resembled a stone rather than a large rain drop. But, all in all they were just as amazing no matter what the shape(or so I’m tellin’ myself). Topped off with a delicious cream and a raspberry to sit, they were a mini meringue marvel. -Heat the sugar in the oven, when hot, start the egg whites on the mixer, then when white and fluffy pour in the sugar. -Brush the inside of the piping bag with colour and pipe away! Secondly, we made a deliiiiicious chocolate tart, with a soft and gooey centre coated in a crispy base it was the absolute masterpiece. Who doesn’t love a chocolate based treat? –Rub the butter, sugar, salt and flour together until it resembles breadcrumbs, then add the eggs. Bring the ingredients together into a smooth dough. -Boil the cream and sugar on the stove, take off the heat and then add the chocolate and butter. Add the eggs slowly and bake for 15 to 20 minutes. Unfortunately there’s no final photo of this as myself and a friend ate it straight away…hello chubba’s. Hello to Swiss Roll, a firm family favourite and one that’s quick and easy to do. Edible from the Summer right on through to Winter, with a simple change in ingredient and hey presto Swiss Roll all year round. Sponge, jam and cream…What.A.Treat. -Whisk the sugar and eggs until light and fluffy, then fold in the flour. Pour onto a tray lined with parchment paper and bake at 180 for 15 mins. -Slowly roll the roll whilst holding onto the greaseproof paper. After trying several scraps and chowing on down on some chocolate tart, it was nearly time to go home. With a resounding applaud for the wonderful chefs at Wilmslow Cooking School, we finished off with our food packaged to go and a beyond amazing goodie bag. Not only did I learn to cook a mean set of desserts, understand the power of Kenwood but I also met some really nice people too! -Thanks to JoeBlogs network and Kenwood for a seriously amazin’ Sunday! P.s What’s your favourite cake? What a great experience! I love the sound of the chocolate tart the best! Though the swiss roll looks absolutely perfect!